I know I'm late on discovering this book. I'm really enjoying it thus far. I'm only half way through, and I already feel like I've gotten so many little tidbits of wisdom to apply to my life. This seems to be a really good book for anyone who may be at a crossroads in life and trying to figure out what is their true calling or purpose here on this Earth. Trust me, I'm at that crossroad. Will let you guys know at a later date what I think of this book after I've finished it. The charming tale of Santiago, a shepherd boy, who dreams of seeing the world, is compelling in its own right, but gains resonance through the many lessons Santiago learns during his adventures. 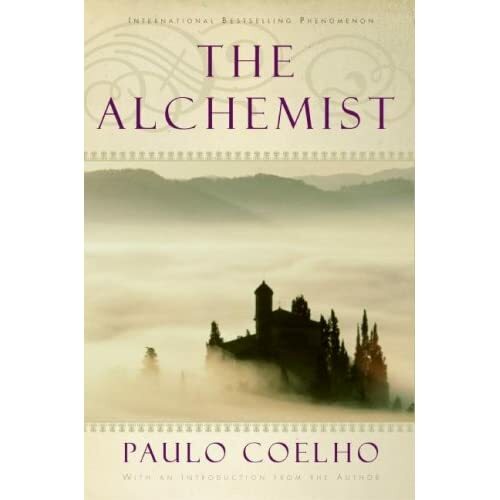 He journeys from Spain to Morocco in search of worldly success, and eventually to Egypt, where a fateful encounter with an alchemist brings him at last to self-understanding and spiritual enlightenment. The story has the comic charm, dramatic tension and psychological intensity of a fairy tale, but it's full of specific wisdom as well, about becoming self-empowered, overcoming depression, and believing in dreams. The cumulative effect is like hearing a wonderful bedtime story from an inspirational psychiatrist. Comparisons to The Little Prince are appropriate; this is a sweetly exotic tale for young and old alike. This might possibly be one of my most favorite books. I could elaborate why, but I don't want to spoil it for you. When I have children, I will read them this book, so they know to always, always follow their dreams no matter what society tells them they can't do. I've read this book and LOVE it so much. I convinced my husband, father, and sister to read it as well. I think I will pull it out and give it a another read. I was late too discovering this book! I read it last year for the first time and it's definitely a book to keep around. I was experiencing so many different emotions and thoughts about where I was mentally, physically and spiritually. Taking the time to read this book helped to open up my perspective on sooo many things. Enjoy Nik!